Trinity Sunday is “the celebration of the richness of the being of God . . . the occasion of a thankful review of the now completed mystery of salvation, which is the work of the Father through the Son in the Holy Spirit.”1 But when we sit down to write a Trinity Sunday sermon on Matthew 28:16–20, we may discover that we are so used to thinking of this passage in connection with other topics (like baptism or mission) that a Trinity Sunday outline does not immediately suggest itself. 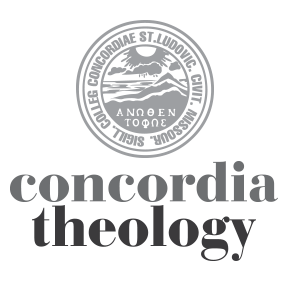 For a detailed exegetical analysis of our passage, I must simply refer the reader to the “Lectionary @ Lunch” posting on Concordia’s website. Still, a brief discussion of vv. 17–18 is in order. The preacher must fight the temptation to skip over vv. 16–18 as though they were only preliminary. The context is as important to this text as to any other. The end of v. 17 has generated much discussion among modern interpreters. We read that, of the eleven, most worshiped Jesus when they saw him, but a few (of the eleven) did something else. The verb translated by both NIV and ESV as “doubted” suggests being divided within oneself about what to do rather than the kind of unbelief we associate with doubt. (This word is not used to describe, e.g., “doubting Thomas.”) R. T. France, who suggests the translation “hesitated,” provides a helpful discussion of this word.2 The verse, especially reinforced by other passages from Matthew, gives us a picture not of disciples refusing to worship Jesus because they did not believe in him, rather of disciples who were so confused and overwhelmed by the sight of their risen Lord that they did not know what to do. Recall that the last time these men had seen Jesus they were fleeing for their lives, abandoning him to his captors. What is the proper greeting when you meet someone whom you have betrayed and denied and handed over to the cruelest of deaths but who is now risen from the dead? Hesitation is, humanly speaking, quite understandable here. The first participle of v. 18 may seem so commonplace as to be insignificant, but there are only two places in the Gospel where Jesus approaches someone: here and in 17:7. Jesus’s response to his disciples’ confusion and hesitation is to come to them. And to speak. All four evangelists agree that seeing Jesus (even the risen Jesus) does not bring an end to doubt and fear or unbelief; it is the word of the Lord that creates and strengthens faith, reconciles, and enables obedience. Commenting on v. 18, France notes: “The disciples themselves speak no words in this final scene, where the focus falls fully on Jesus himself; their role is to listen, to understand, to obey.”3 If Matthew has constructed the passage so that “the focus falls fully on Jesus himself,” should our sermons do less? The challenge that remains is to do justice to the focus of the day—the Holy Trinity—without losing Matthew’s focus, which remains “fully on Jesus himself.” I would suggest that the preacher not make baptism or mission the theme of this sermon on Matthew 28, but to proclaim instead the way our Lord Jesus reveals the “richness of the being of God” to us in his own person. 1. In his compassion: as risen and victorious Lord he still condescends to appear to his disciples, approach them in spite of their hesitancy and little faith, and speak to them. 2. In his commission: he includes all as recipients of the promise of baptism and word, and he includes us fallen and weak-faithed ones in the task of making his disciples. 3. In his commitment: he will be and remain Immanuel, God with us, to the end of the age. 1 Philip H. Pfatteicher, Commentary on the Lutheran Book of Worship: Lutheran Liturgy in Its Ecumenical Context (Minneapolis: Augsburg Fortress, 1990), 301. 2 R. T. France, The Gospel of Matthew, NICNT (Grand Rapids: Eerdmans, 2007), 1111–1112. 3 France, 1112. 4 Martin H. Franzmann, Follow Me: Discipleship According to Saint Matthew (Saint Louis: Concordia, 1961), 225–226.